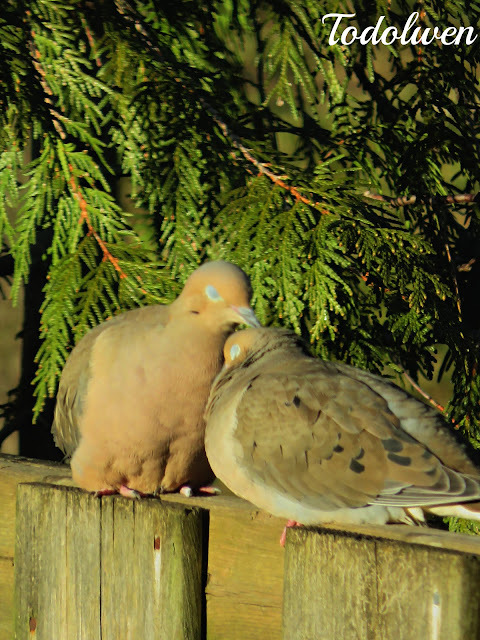 I have a special place in my heart for doves. I love watching and listing to them and it makes me happy when they come to visit our garden. For the past three years now a few of them have taken to building a nest in the blue spruce that lives close to our front door. 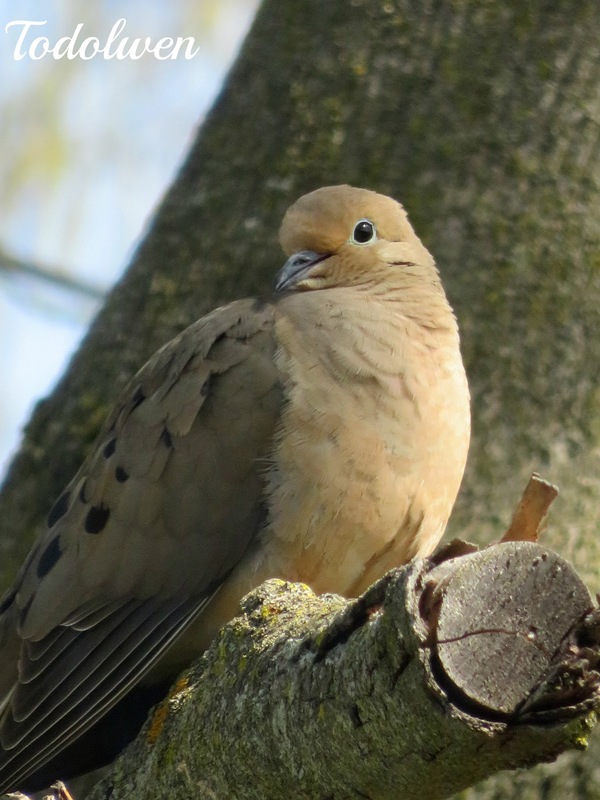 So far every time they have laid their eggs, something unfortunately spooked the doves which lead to them abandoning the nest and eggs - Which is always sad. 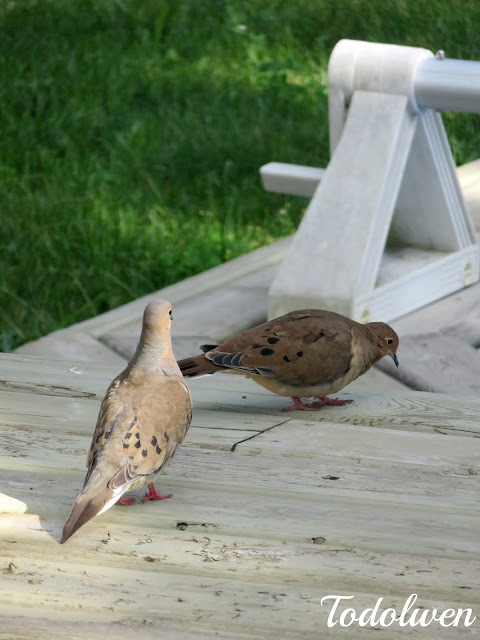 Doves are so gentle and at times the slightest thing can scare them away. But the doves are back again. You can see them in our garden in the early morning, at midday or just before the sun goes down. They sit in our maple tree or anywhere else they feel comfortable. I try to have my camera ready and at hand in the house these days because you never know what you might see, right? I have been able to capture these lovely feathered creatures several times which makes my little heart smile and that is what I am sharing with all of you today. and be very affectionate with each other. 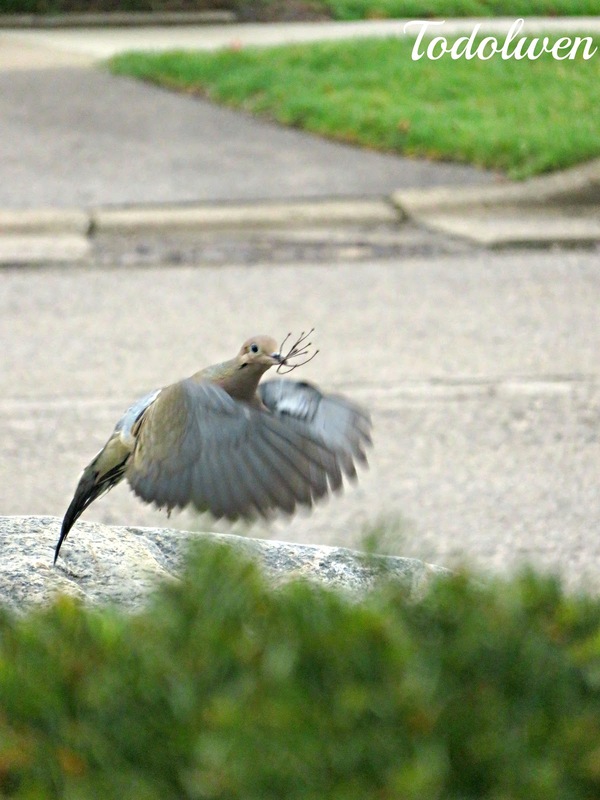 About 2 or 3 weeks ago I noticed that one of the doves was doing a lot of flying to and from our front garden and was also sitting on our big rock that sits in the front flowerbed. Most of the times the dove or rather he was carrying something in his beak. Sometimes a twig, then a piece of dried grass or a piece of a plant. ... which went on for four or five days. It didn't matter if it was cold, raining or the sun was shining. The little dove was a busy bee and wouldn't stop until the sun went down. This could only mean one thing; a new nest was being built. This time a better place for a nest was chosen which was good thing. It was away from our front door and was in the most dense part of the tree. 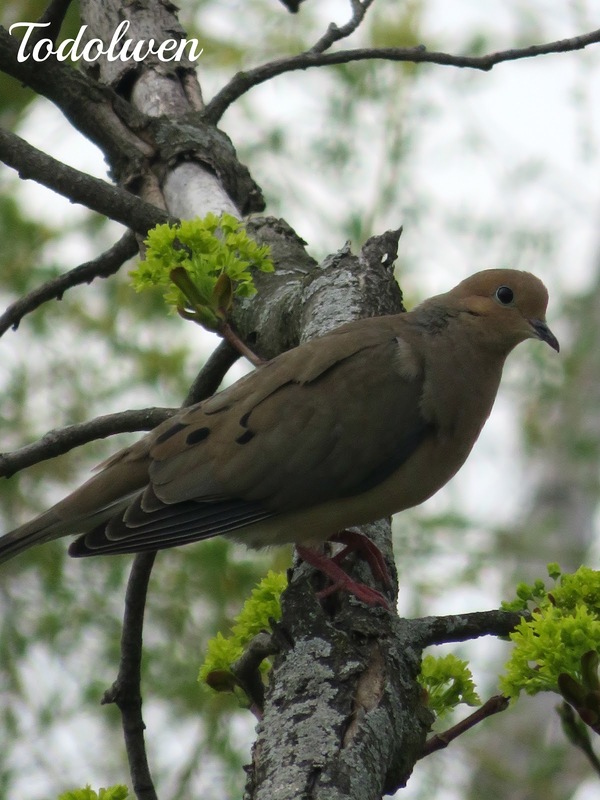 A week, or so ago, I thought that the doves were gone again, so I dared to peek into the tree. There deep down in the branches of the Evergreen, tucked away was the little girl dove, sitting on a nest. I was so worried that I might have scared her but it seems that I didn't. She didn't fly away and the little boy dove came to change places with her that evening. I am hoping that this time everything will go well. 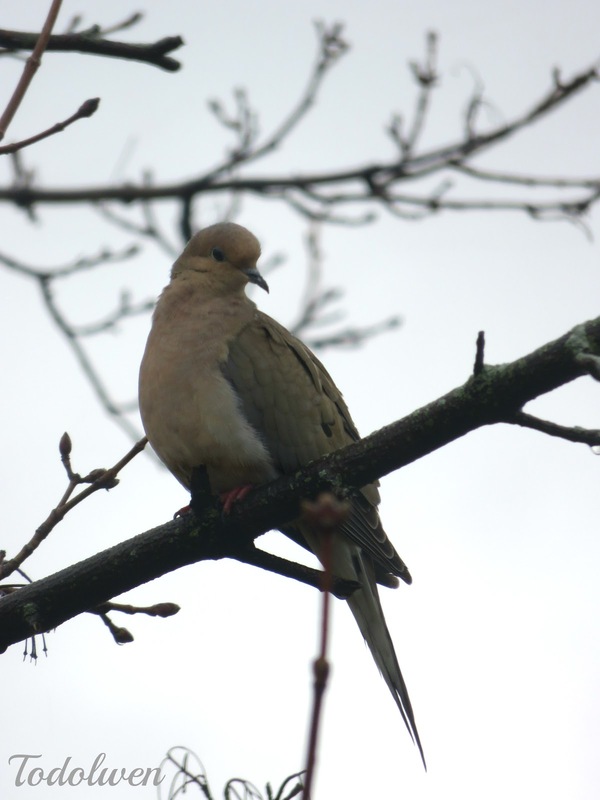 I saw the dove two days ago flying out of the tree again but since then nothing. I won't be foolish though and try to check up on them again. I am not going to take the chance of doing anything wrong this time. That is why I don't have any other photographs. I will just have to wait and see what happens. 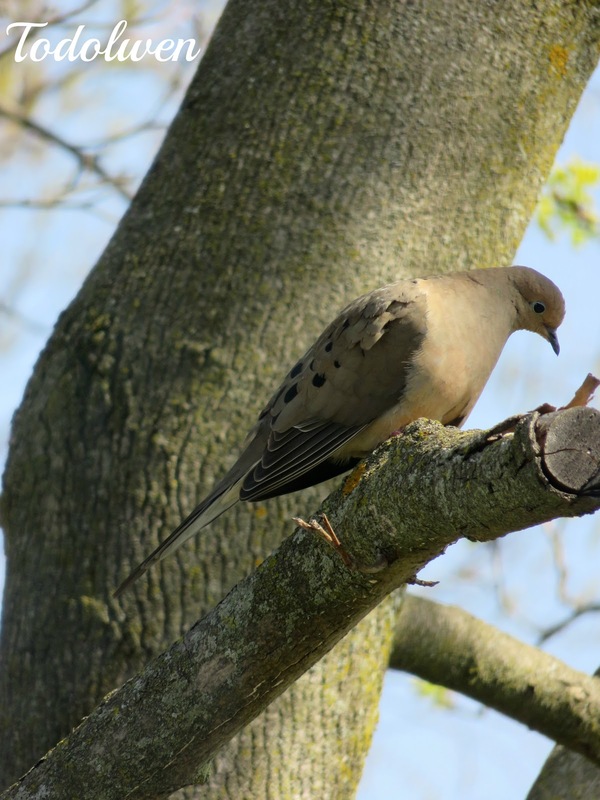 It is nature and hopefully this time, Mother Nature will keep the doves and eggs safe. 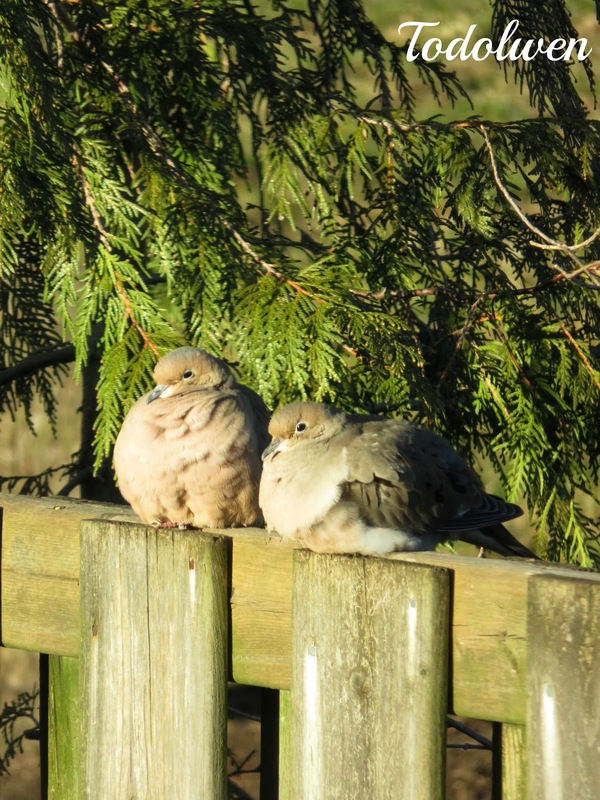 I am so hoping that this time we might have little baby doves. Please, keep your fingers crossed that all will be well with my feathered 'tenants'. 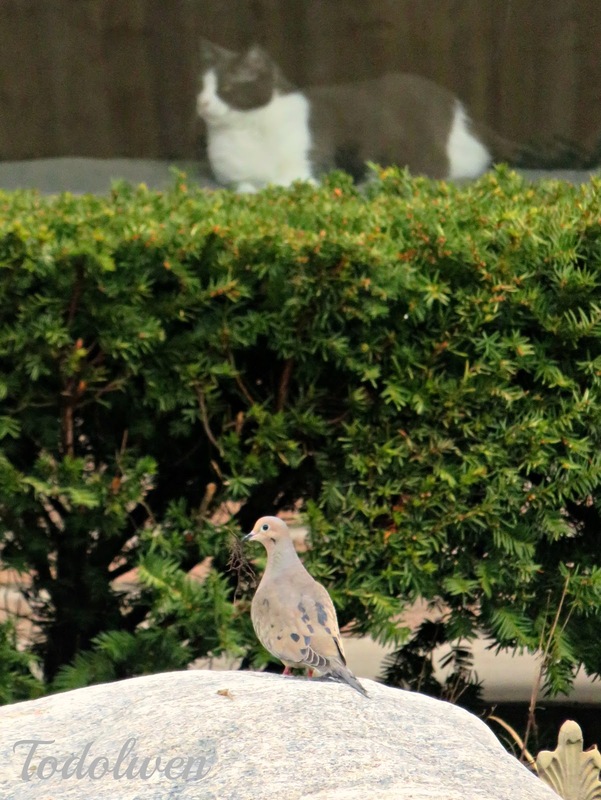 Even our cat Lexi is keeping an eye out for the doves, from behind our living room window. Maybe the little dove is keeping on eye on our cat?! ... I have decided to have another garage sale this morning. It is a last minute decision really, I had forgotten how many old treasures that were hiding in my basement. Many of them have been there packed away in boxes and cupboards since a few years. My thoughts on that is; if it hasn't got sentimental value and you are not planning on displaying it in the very near future, it can go. A little harsh I know but sometimes it is needed. Fingers crossed again that the rain will hold off until the afternoon and that no rude people will turn up again. Thank you for stopping by to visit me here again at Todolwen. Oh Karen, how pretty they are! And your photos are GREAT! 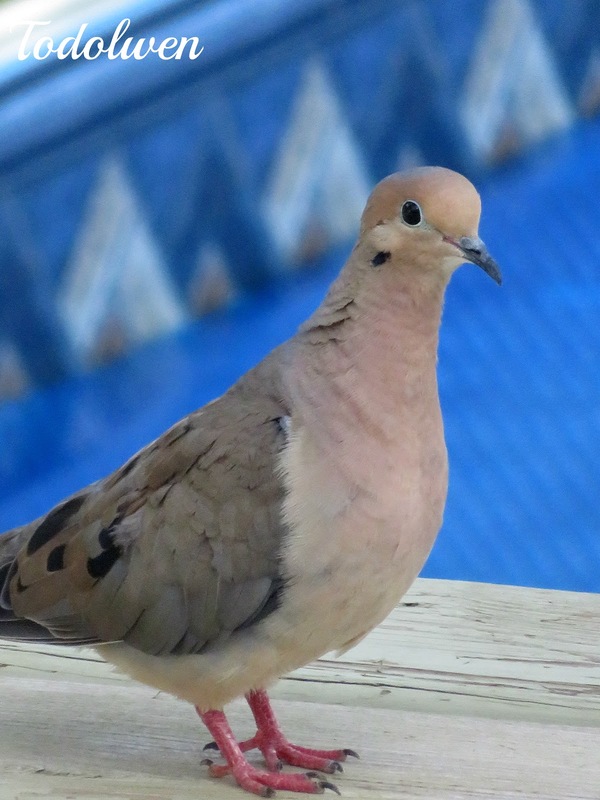 I love doves too - we have them coming to our bird feeder on the balcony all the time. Quite often they will perch on the window sill and peer in at us. I'm often working in my sewing room and can feel eyes on me....when I look up there will be one or two sets of dove eyes peeping in at me. So pretty! 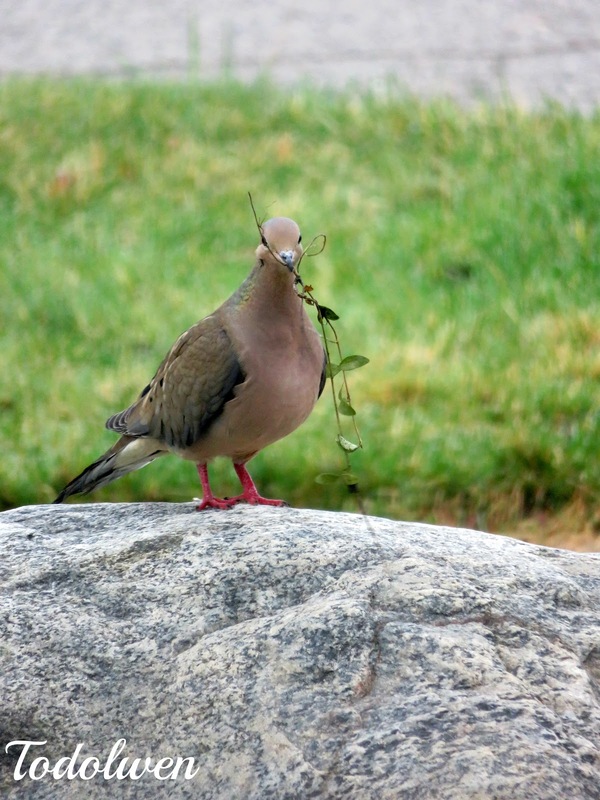 Great photos of the doves. Such beautiful photos of these beautiful birds. I love to watch them in my back yard. I've heard they only stay in places of peace, so you must have a yard that suits them. Thank you for sharing - I'm a bird lover.